The Minimum Wage Order Poster is a minimum wage law poster by the Colorado Department Of Labor and Employment. This is a mandatory posting for all employers in Colorado, and businesses who fail to comply may be subject to fines or sanctions. This poster must be posted in a conspicuous place where all employees will see it. The poster lists the minimum wage for regular workers as well as the minimum wage for those for receive tips and who to contact should wages that are given are less than the minimum wage. It appears you don't have a PDF plugin for this browser. 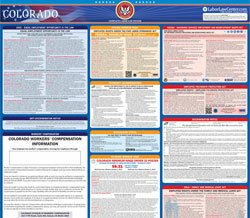 Please see the link below to download colorado-minimum-wage-order-34-poster.pdf. bo th state and federal minimum wage laws, the law which provides a higher minimum wage or sets a higher standard shall ap ply. Service, C ommercial S upport Service, F ood and	 Beverage, an d	 Health an d Medical. e s tate o r federal m inimum w age. e employer and may accommodate  flex	ible work shift scheduling. hours, 	seven 	(7) c onsecutiv e twenty -fo ur ( 24) hour pe riods. each position, as provided in the Fair Labor Standards Act. yee leave 	the premises for said rest period.
" meal while performing duties. without any loss of 	time or compensation. ee’s wages or depo	sit. described in the Colorado Wage Act, § 8-4- 101, et seq., C.R.S. (201 6). Labor, Wage and Hour Division, 1999 Broadway, Suite 710, Denver, CO 80201- 6550. Telephone (720) 264-3250.